University is back in full swing for me, meaning my first set of papers and assignments are due early this month. With all the extra work coming in, I rely like everyone on what my preferences are when it comes to studying, reading, or just some good old fashioned procrastination. I sometimes feel my study habits are fairly inverted compared to the usual, since I enjoy a noisy environment when I am reading or studying. With reading, I require either complete silence, or a room filled with many different sources of noise, so I cannot properly focus on one specific sound. Studying for an exam is a little different. I can have a show running in the background to stop the monotony of the process, but complete silence can be fairly distracting for me. As I am writing this review, I have a TV show running in the background, however, at some points, I just require extra focus with complete silence. We all have different styles or preferences when it comes to studying or working. Most people I have talked to prefer a quiet environment to properly focus on everything they have to do. As well, many people are working on their computers, which will have to be quiet to have the right environment. Today, we have the SilverStone Kublai KL07 up for review, which boasts some extra features to keep your computer quiet. 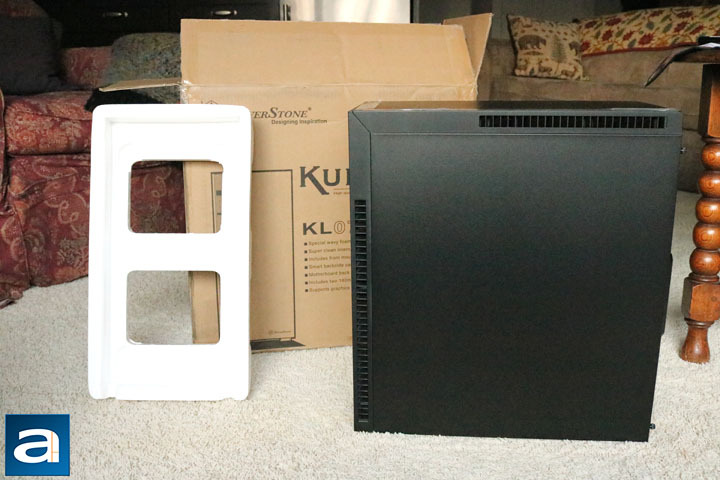 Read on to find out if this case is a worthy contender in the silent chassis market. 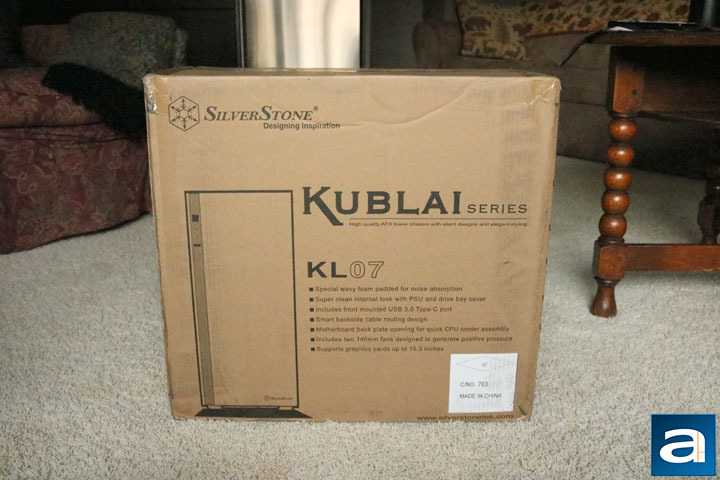 The SilverStone Kublai KL07 arrived, like all computer chassis, in its retail box, which doubles as the shipping box. It shipped all the way from Chino, California, and arrived to Calgary, Alberta, our APH Networks location in good condition. As usual, some of the corners were a bit beat up, as well as some of the edges. However, there were no major dents found anywhere on the outside. After inspecting the packaging, I continued to see how the product actually fared. The retail packaging is simple, as with most cases' retail boxes, and there is a diagram of the case on both sides of the box. Boxes for cases are simple, because you will not always find them in store as they are. To properly market a case is to demonstrate how the components of a computer fit together on the inside. So usually, retailers will have some pre-built systems on display. The rest of the box has the specifications found on the one side, and some other cautionary and warranty information on the other. On either side of the case inside of the box are two styrofoam blocks to hold it in place during transport. There is also a plastic bag covering the case to prevent any surface damage. Expansion card	Compatible up to 15.3" in length, width restriction – 6.5"